Science, risk management or just politics? Although there are those that call for a complete transformation of the energy economy in just a few years (not really possible anyway), the current reality is that many governments around the world are taking a step by step response to the issue, developing policy approaches, implementing them in a measured way and learning from the experience. There is no panic, no drastic action and no aggressive control, just practical risk management through careful policy design. Look at just one example. Over the last twelve months a very prudent approach has been implemented in Australia, with the gradual introduction of a carbon price across the economy. Initially it is a fixed price but in three years will transition to a market responsive price, although even that will have a collar. Again, the reality is very different. Continuing with the above example, Australia has used the money flowing from the carbon price mechanism to reduce taxes and ensure that trade exposed industries are kept whole, rather than being competitively disadvantaged. In the EU where climate policy has been well established for nearly a decade, member state governments have collected very little in additional revenue. Under the EU Emissions Trading System allowances have been grandfathered in the early years with only minimal auctioning. Although this will change from 2013 onwards, there has been no unseemly rush for revenue. Rather, significant sums of money have been channeled into renewable energy development, CCS and energy technology R&D. Charitable foundations have also played an important role in supporting think-tanks and policy forums, not with the view of “saving the planet”, but with a clear and transparent agenda aimed at climate change policy development, design and implementation. Many such organizations have participated in and even led the development of policy instruments such as cap-and-trade, low carbon fuel standards and renewable energy targets. Apart from the EU and Australia, a modest carbon pricing policy is in place in New Zealand, California, many US North East States, Alberta and British Colombia, with discussions and consultation underway in South Africa, South Korea, China and numerous other countries and states (click here for a map). Meanwhile the scientists and economists at MIT, one of the USA’s premier universities frames the issue in terms of risk and uncertainty, rather than absolutes. 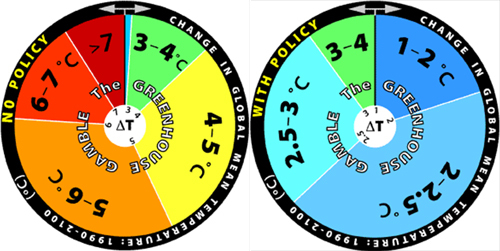 Their Greenhouse Gamble wheels were developed by the Joint Program on the Science and Policy of Global Change to better convey uncertainty in climate change prediction. Their roulette-style spinning wheels depict the estimated probability, or likelihood, of potential temperature change (global average surface temperature) over the next 100 years, with policy implementation as the principle variable between the two. The policy framework necessary to move between the two is more substantive than that which we see today, but the path forward being taken by many nations is at least aligned with the required direction. This state of affairs is likely to persist for much of this decade, but is nevertheless still a critical capacity building phase for the future. Certainly if all nations moved forward with the types of efforts described above, the risk profile of the second wheel becomes achievable. According to MIT, doing nothing gives us around 1-2% chance of modest warming, i.e. less than 2°C, and something in the region of 30% chance of 5-6°C warming. Betting on this feels more like politics at play than any rational approach to risk management.